Description: Waiting for a clear signal to proceed east toward Griffith is this mixed freight. Description: The Canadian National freight sits patiently at the Hartsdale Junction. 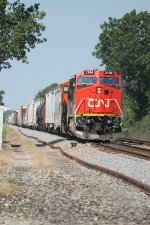 Description: CN 2164 trails an eastbound mixed freight at Genoa, IL. Description: I had to snap a shot of these great sounding horns! If only this unit was leading while heading west! Description: BNSF empty oil train U-NSWEPP. Description: CN 2164 is along for the ride at Industrial Drive in Waupaca on this northbound freight. Description: My favorite pic of the month. A sunset shot of Train 315 heading north past the Cargill grain elevator, approaching Princess Street. Description: Northbound Train 315 approaching Princess Street crossing. Description: CN container train parallels Hwy. 41 and passes American Colloid Co. as it heads southwest via former SOO rails at Snells, WI on 28 Feb. '18. 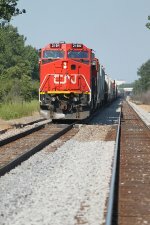 American Colloid is serviced by CN via former C&NW rails. Snells, formerly known as Snell’s Station or Snell’s Crossing, is now little more than a map dot in the Town of Neenah, Winnebago Co. This small, rural community once included a post office, depot, cheese factory, sawmill, school, and stockyard. Snells was located at Mile 183 on the SOO’s Trevor to Somerset line and Mile 173.1 on the C&NW’s Milwaukee to Marinette line. I do not know if each railroad had their own small depot, or if one small depot served both railroads, I suspect it was the latter. It does not look like any real remnants of the original community remain. Even the station sign, erected after the depot was removed, is gone. Description: Series of pics in the snow of CN 2164 switching cars at CN Duff Yard in Fort Erie. Description: Series of pics in the snow of CN 2164 switching cars at CN Duff Yard in Fort Erie. Here the train pushes back under the new Central Avenue overpass. Description: An oil load approaches a three way meet at Clyman at 1501. Description: Built May 1992 as ATSF 805. Description: 391 approaches the right turn to the J at 1149. Description: A CN through freight approaches the W. Bell St. overpass as it heads northeast via former SOO rails at Neenah, WI on 13 Jan. '19. The former C&NW rails are in the foreground. Hwy. 41 can be seen in the background. Description: 343 starts its descent into Fond du Lac at 1141.